Now money has become so important and integral part of life that we have stopped deriving happiness from small things around us. But to make the most out of this life we must take meaning and happiness from small things around us, How about playing with the kids and observing them, Listening to the chirping of birds or just looking at the butterfly. This in turn Make big occasions unnecessary, making us to enjoy the moment you’re living in. Le Corbusier has said The home should be the treasure chest of living. In big city where space is such a big constraint, we ignore or have very limited opportunity to do small things which gives us a lot of happiness. For Example. In childhood we used to have our own flower garden, kitchen garden in our home. The blooming of flowers, growing up of vegetables gave us immense happiness. In most of the homes now garden seems unviable as there is rarely any space. But you can still make your balcony or the window space as your flower/kitchen garden. Good to some good real estate developers are creating space in apartments where you can have some flower/vegetable tree for yourself and your family. I am sure when the flower will start to bloom it will give you more happiness than that upto 50% sale which is going on your nearest lifestyle store and when you reach there you see the offer is on selected items. 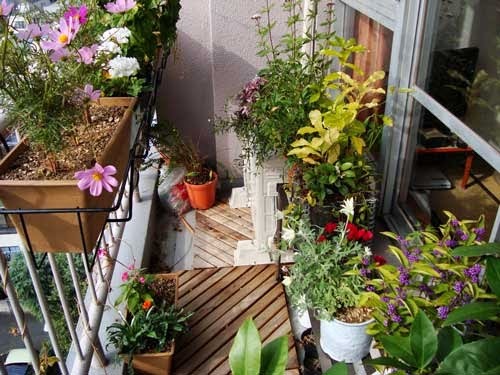 You can see the following image where a balcony has been converted to a little garden Just remember Creating a simple and elegant balcony or rooftop garden isn’t hard to do if you have a little patience. Similarly I had experienced the bonding between one with his family, friends and neighbour is really a great asset. Those from villages/small towns can very much relate to the fact how connected they were in their childhood, how our parents talked and shared a repertoire with everyone be our neighbour, our grocerer, the milkman, the fish vendor, each and everyone. In my initial PG days in a big city I missed it very much. But I have experienced its changing now the housing societies, CHS or RWS in whatever name you called it started to created that atmosphere. The celebration of festivals of various religions, Independence & Republic day along with annual day. sports meet, rangoli are creating that much required interaction. We have just to participte in our Housing society's various function. You will discover the happiness after knowing each other. When I started attending our function I was surprised after seeing the talents of the kids in singing & dancing, Some play unbelievably well in badminton and volleyball. My take on life is to enjoy small things around you by doing small small things, Which will give you a lot of smile.